“Hey Finance Twins, I have $45,000 in student loans with high interest, should I refinance my student loans?” We get this email all the time. All. The. Time. So if you aren’t sure if you should refinance your student loans, you aren’t alone. In fact, most people with student loans have wondered if it’s a good idea. And we are glad you are here, because for some people, refinancing their student loans can actually save them a lot of money. But before we dive into it, let’s get on the same page about what it even means to ‘refinance student loans’. It sounds a lot more complicated than it actually is. Can I Refinance My Student Loans If I Have Private Or Federal Student Loans? Why Would I Want To Replace An Old Student Loan With A New One? Whenever we get asked: ‘should I refinance my student loans?’ – the first thing we do is explain what it means to refinance your student loans. Some people think it means to borrow more money for new expenses, while others think it means to ask for forgiveness when you miss a payment. But refinancing means something different. To refinance student loans simply means to find a new student loan to replace your existing one. You are essentially asking if it makes sense to find a better (lower interest) student loan. In other words, when you refinance your student loans you are going to a lender with an existing set of student loans, and asking them to lend you new loans to replace your old ones. 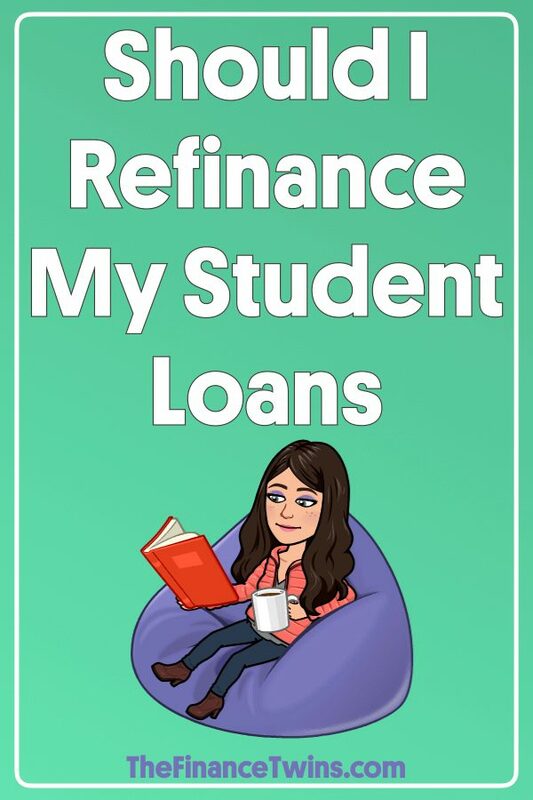 If you decide to refinance and get approval from the lender, they will pay-off your existing student loans and issue you a new student loan to replace it. You’ll still owe the same amount, but you’ll get new repayment terms and a new interest rate. Think of it like trading in a used car for a new one. And just like trading in an old car for a new one, for some people that might make a lot of sense, but for other people it might be a bad idea. In general, remember that there are federal student loans and private student loans. Both types of loans can be refinanced, although the decision to refinance might depend on the types of loans that you have. Many people have a combination of both federal and private student loans. It doesn’t matter if your loans have already been consolidated or have already been refinanced. You can still refinance them. 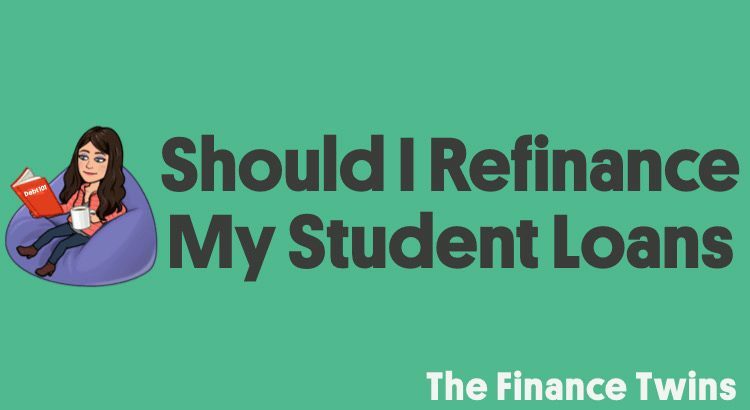 The important part is knowing if you should refinance your student loans or not. If you aren’t sure if your loans are federal or private, you can ask your student loan servicer (the company who sends you the monthly student loan bill). You can also check in the documents you signed to get the loans. There’s actually a few reasons why refinancing your student loans could be a great decision. But at the end of the day, it all comes down to money and making the best financial move – for YOU. After all, the reason a lot of people go to college is to kick-start their career so that they can earn a living. So if refinancing doesn’t make financial sense for you, then don’t do it. Even if it seems like everyone else it doing it. Knowing if you should refinance student loans seems daunting at first. We know this because one of us has over $225,000 of student loans, so we had to figure it out ourselves. And while it may not make sense for everyone to refinance their student loans, there’s a few times when it’s a no-brainer – saving you thousands of dollars. In general, you should consider refinancing your student loans if it will save you money, you have a stable financial situation, and you want to or are already accelerating your repayment. Amanda: A 25 year old engineer who graduated with $35,000 of federal student loans. Amanda is hard working and excited to finally be debt free. She pays more than the amount due on her loans every month and is on a standard 10 year repayment plan. Because of her stellar credit, she would qualify for lower student loan interest rates if she were to refinance. Additionally, she has no plans to go back to school and is happy in her career. Gerry: A 34 year physician’s assistant who has $120,000 of student loans (both private and federal). Gerry earns a high salary and wants to repay his loans quickly so that he can start to save to purchase his first home. He works in a private medical practice, so he doesn’t qualify for Public Service Loan Forgiveness. His credit is much better now than it was when he first applied for his private student loans so he’ll be a good candidate for lower interest rates. Gerry is able to save a large portion of his monthly income, so a higher monthly payment won’t affect him – making a shorter repayment period ideal. Clearly, there are a lot of people who could benefit from refinancing their student loans. But that doesn’t mean it’s right for everyone. While saving money is very appealing, refinancing needs to be considered carefully to make sure you are making the right decision. In general, you should NOT refinance your student loans if you have federal student loans and rely or expect to rely on some of the benefits of federal loans (like income based repayment plans). For example, if you think your income might drop by a lot in the future, then sticking with federal student loans and an income based repayment plan might be ideal. You should also not refinance if you only qualify for higher interest rates due to bad credit. This may happen if you’ve experienced a drop in your credit score. Another benefit unique to federal loans is Public Service Loan Forgiveness (PSLF). To qualify for PSLF you must work for a government organization or a 501(c)(3) not-for-profit organization and be enrolled in one of the income-driven repayment plans. After you make 120 qualifying payments your loans are forgiven. There is no limit to the amount forgiven. Refinancing your student loans will end your eligibility for PSLF, so it is important to think about this. Private lenders do not offer this benefit. Leslie: A 28 year old grant writer who works at a local 501(c)(3) not-for-profit organization and has $54,000 of federal student loans. After graduation she realized she had a passion for helping others and scouted jobs at non-profits. Planning to stay in the industry for the foreseeable future, she is a solid candidate for Public Service Loan Forgiveness. As a result, it probably would not make sense for her to refinance her student loans. Anthony: A 23 year old psychology graduate with $63,000 of federal student loans. Upon graduation Robert bounced between odd jobs while trying to figure out what he wants to pursue as a career. He is even considering going back to graduate school to potentially become a software engineer. His income is low and he relies on a federal income based repayment plan in order to keep his monthly payment manageable. For this reason, it probably wouldn’t be a wise decision for Anthony to refinance his student loans. 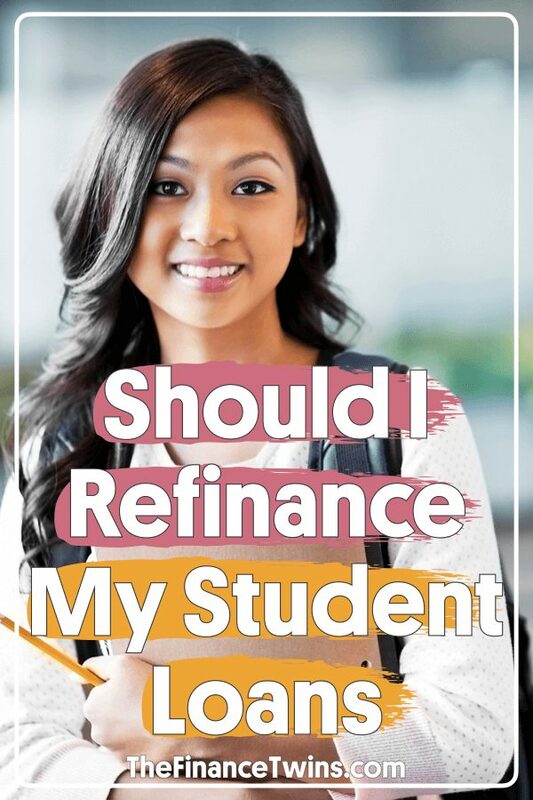 If you’ve decided you’d like to refinance your student loans, it’s important to have good credit and stable income, you should refinance as soon as you can so that you can take advantage of paying less interest over the life of the loan. Having strong credit and stable income will give you access to the lowest interest rates. Remember that refinancing won’t necessarily lower your monthly payment. In fact, your payments may increase if you choose a shorter payment duration in order to pay it off faster. However, this could save you a lot of money over the life of the loan. The savings in interest payments over the life of the loan could be staggering with shorter repayment periods – Especially if you have a lot of student loans. This is why having a stable and reliable income is important. For example, if you have $70,000 in loans, refinancing and lowering your interest rate from 6% to 5% could save you $4,161 over a standard 10 year repayment period. That’s a lot of extra money you could use to save for retirement (for example to fund a Roth IRA). If you are considering whether you should refinance your student loans, there are lots of options out there for you. There a lot of companies who specialize in student loan refinancing like SoFi, Earnest, and Laurel Road, among others. Once you complete the application the lender will usually need to verify your employment and income information. The application and verification process has improved over time, but don’t expect a 5 minute process either. We always recommend that you apply to at least 2 different lenders so that you can compare offers, and choose the one that is best for you. The great thing is that by applying and shopping around you aren’t committing to anything, so if you aren’t satisfied with the rates or offers you get, you can always stick with your current loans. Don’t feel obligated to refinance your student loans if you don’t get a refinance offer that you are happy with. In general, there are two types of interest rates available to you: fixed and variable. A fixed rate means that the interest rate will never change and will remain the same throughout your repayment period. A variable rate can vary (up or down) over the course of repayment. It will usually be tied to a financial market index like LIBOR (a fancy term for an interest rate that banks charge each other for short term loans). It is hard to know when interest rates will go up, so if the idea of the rate changing makes you nervous, then a fixed rate loan will help you sleep better at night. However, a variable loan can help you save money, even if the rates go above the fixed rates. For example, if the initial rate on a variable loan is less than the fixed loan rate and you pay off 50% of the balance over the course of a couple years and then rate increases, you will only be paying the increased rate on the remaining balance. Over the course of the loan, this will result in you actually paying less. This is especially true for those pursuing aggressive repayment schedules (like a 5 year repayment). Of course, it is possible the the rates could go up a month after you refinance, but changes are typically small. Rates can be adjusted monthly, quarterly, or yearly depending on the terms. In general, if the markets are going up, the rates will increase and if the markets perform poorly, rates will stay down. But again, it’s hard to predict so don’t make the decision to refinance based on what you expect with future interest rates, because you might not be right. When it’s time to apply, lenders want to see that you have strong credit. They’ll review your credit report to see if you have a history of on-time payments. They will also want to review your income to make sure that you have the ability to pay off the loan. If you have $200,000 in loans but are earning minimum wage, they might not be as excited to refinance your student loans (and you’d be better off with an income-based repayment plan anyway). If you don’t have strong credit they’ll likely ask for a cosigner to refinance your student loans. You need to make sure there’s mutual trust with your cosigner, because they’ll also be responsible for the payments if you are unable to make them. There are many reputable student loan refinancing companies. We are most familiar with ELFI, SoFi, Earnest, Laurel Road, CommonBond, and LendKey. We’ve heard enough positive feedback from customers that we feel confident recommending them to you. Are there other great lenders not included here? Of course. As with any other financial decision, you just need to do your homework so that you are making an informed decision. Note: rates updated as of Jan. 2019; table includes affiliate links to leading student loan refinance companies. Remember that refinancing isn’t right for everyone, but you should consider refinancing your student loans if it will save you money, you have a stable financial situation, and you want to or are already accelerating your repayment. If you are pursuing PSLF, rely on the protections afforded by federal student loans (like income based repayment plans) or don’t have a stable income, then now is not the right time for you to refinance. If that’s the case, creating a rock-solid budget and financial plan is probably the best move.